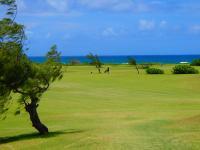 Our Kahuku condos provide everything you need for an idyllic Hawaii vacation on Oahu's scenic northeast shore. Enjoy fine dining at Turtle Bay Resort, visit the famed north shore surfing beaches and take a drive down the windward shore to the vibrant towns of Kaneohe and Kailua, both set on expansive bays with beautiful beaches. There is a nice beach fronting the Turtle Bay Resort that provides some excellent snorkeling as long as the ocean conditions are relatively calm. Take a drive along the north shore to explore numerous other nice beaches and coves where the snorkeling can be outstanding. Make sure to take a look at the famed north shore surfing beaches such as the Banzai Pipeline and Waimea Bay. Surfers come from all around the world to compete against each other in the big winter surf on Oahu's north shore. Head over to the town of Laie to visit the Polynesian Cultural Center where you can learn about the various Pacific Island cultures through hand-on exhibits and demonstrations. The Center also has an IMAX theater and puts on an theatrical dinner show to a sumptuous buffet. Nearby is Laie Beach Park where you can enjoy the clear blue waters with the offshore islets creating a picturesque scene. 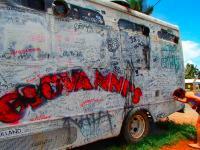 Kahuku is known for its many shrimp trucks parked along Kamehameha Hwy. (the town's main street) offering a range of local-style creations including lemon, garlic and other choices, along with lots of butter of course. For some great local treats check out the Kahuku Farms Country Cafe. Try the tangy lilikoi sorbet, farm fresh salads and fruit grown on the farm, and then quench your thirst with their delicious mango iced tea. More shopping and dining choices can be found in the larger towns of the windward and north shores from Kaneohe and Kailua to Haleiwa.